A "midnight" partial eclipse of the sun that, by a fluke of timing, began a day later than it ended provided spectacular views for skywatchers around the world lucky enough to catch the rare spectacle. The solar eclipse began early Thursday (June 2) over northeast Asia, but actually ended Wednesday night because its narrow path of visibility — where skywatchers could see the event — crossed the International Date Line. For amateur and professional astronomers who caught the eclipse, the view was spectacular. "Beautiful and impressive eclipse of midnight sun," said Knut Joergen Roed Oedegaard, an astrophysicist at the Norwegian Centre for Science Education in Oslo, Norway. "This night northern Scandinavia witnessed the deepest eclipse of the midnight sun since 1985." "Not until 2084 will a more impressive solar eclipse take place in the middle of the night," Oedegaard said in an email. "The rare and exotic phenomenon became very beautiful indeed." Photographer and skywatcher Bernt Olsen snapped this view of the partial solar eclipse of June 1-2, 2011 just during the "midnight sun" in Tromso, Norway. The partial solar eclipse was dubbed a "midnight" eclipse as its viewing path crossed the International Date Line across far northern latitudes. Solar eclipses occur when the moon passes between the sun and the Earth during its "new phase" and appears to block the sun when seen from the ground. When the moon and sun align perfectly a total solar eclipse occurs, which completely covers the sun. Other times, however, the moon only covers a portion of the sun to create a partial solar eclipse. This week's partial solar eclipse was actually the second eclipse of the sun of 2011 (the first was on Jan. 4). Another partial eclipse of the sun will occur on July 1. But it was the timing of this so-called "midnight" eclipse that attracted attention in Norway and elsewhere. Oedegaard organized an effort to broadcast different views of the eclipse live on the Internet in order to share the rare event. "During the eclipse it was substantially darker than normal," Oedegaard said. "It was a silvery grey light, while the sky around the sun was yellow." In Tromso, Norway, the weather nearly spoiled the eclipse for skywatcher Bernt Olsen. Clouds and rain showers obscured the beginning of the eclipse. "This was an rare and a seldom event even up here north, where the nights are bright and a midnight sun eclipse can occur," Olsen told SPACE.com in an email. Olsen said the weather cleared just in time for the peak of the eclipse, when the moon appeared about 58 percent covered. He posted several views of the eclipse to a photo sharing website and the skywatching site Spaceweather.com. In Bratsk, Russia, skywatcher Svetlana Kulkova watched the partial solar eclipse as dawn broke on June 2. 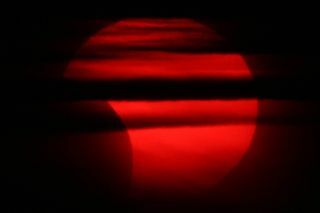 Kulkova said the event started out like a normal eclipse, except that "it coincided with the Bratsk sunrise, making it possible to get beautiful pictures." Smoke from a nearby forest fire and the morning mist added an ethereal feeling to the view, added Kulkova, who also posted images online. Photographer and skywatcher Svetlana Kulkova snapped this view of the partial solar eclipse of June 1-2, 2011 just after sunrise on June 2 from Bratsk, Russia. The partial solar eclipse was dubbed a "midnight" eclipse as its viewing path crossed the International Date Line. June's partial solar eclipse is the first of three solar and lunar eclipses occurring within 30 days. The eclipse trio ends with a July 1 partial solar eclipse over the southern hemisphere, but this eclipse will be visible only from a small area of the southern ocean, far to the south of South Africa. You can follow SPACE.com Managing Editor Tariq Malik on Twitter @tariqjmalik. Senior Writer Clara Moskowitz (@ClaraMoskowitz) contributed to this report. Follow SPACE.com for the latest in space science and exploration news on Twitter @Spacedotcom and on Facebook.